All the candidates who are looking for the Allahabad Bank are informed that the official notification regarding the Allahabad Bank Specialist Officer (SO) Recruitment 2019 has been released by the department. The process for applying the applications will be online. The online applications will start from 9 April 2019. Aspirants will be able to apply till the 29th April 2019. There will be a total of 92 posts. Candidates who are eligible in all as aspects can apply for the same before the last date. The department, Allahabad Bank has issued an official notification regarding the Allahabad Bank Specialist Officer (SO) Recruitment 2019 to fill the Specialist Officer profiles. The declared recruitment is to fill the 92 vacancies of Specialist Officer. The Allahabad SO Recruitment 2019 is available on the official website i.e. www.allahabadbank.in. The department, Allahabad bank has decided to conduct the exam in the month of June 2019. The admin will also launch a few days before the examination. The syllabus for the Allahabad Bank Specialist Officer (SO) Recruitment 2019 is differed according to the post. To know about the syllabus and other information you have to visit the official website, where you can find your syllabus according to your applied stream. Candidates will have to download their Admit Card to join the written examination. 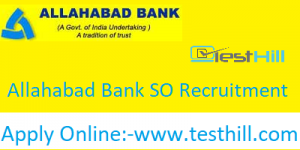 Allahabad Bank Specialist Officer Recruitment Admit Card 2019 will be available on the official website. Candidates will be able to download it from there. They need to provide some required information like registration number, application number, and birth date/password. After filling this information, the admit card will be displayed on your computer screen. Candidates can download it here and take printouts for the exam. Security Officer – Candidate must have a graduation degree in relative trade will be considered for this profile. Civil Engineer – Candidate having Engineering Degree in relevant trade along with having relevant work experience will be eligible for this post. Manager(Fire Safety) – Candidate having Engineering Degree in relevant trade along with having relevent fieldwork experience will be considered for this post. Manager(Law) – Candidate having Degree in Law (LLB) with relevant work experience will be eligible for this post. Company Secretary – Candidates having Degree from any recognized university with ACS from the ICSI will be eligible for this post. Manager (IT) – Candidate having Engineering Degree in relevant trade & along with having Post Graduation Degree in relevant trade and having related work experience will be eligible for this post. Finance Analyst – Candidates who are Graduate and CFA/ICWA/MBA (finance) /PGDBM Degree and having relevant work experience will eligible for this post. Manager (Equity / Mutual Fund Desk) – Candidates having MBA (Finance/ CA/ Cost Management) and having relevant work experience will be eligible for this post. #107 AMS Web Solutions Pvt. Ltd.